Fast exhaust option reduces cycle time for solid goods; slow exhaust option releases chamber pressure slowly and prevents boiling over of liquids. 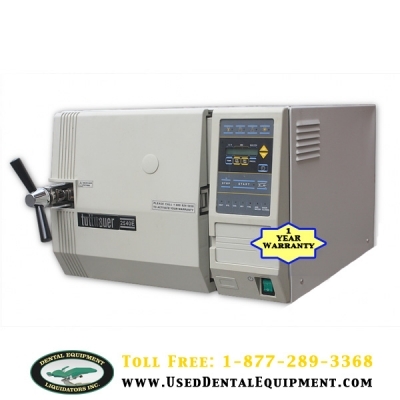 Continuous pressure purge eliminates cold air pockets and ensures uniform sterilization. Large 3.25L water reservoir permits users to control the purity of the sterilizing steam and reduces frequency of fill-ups. Drying cycle prevents rusting of valuable instruments and dries absorbent materials. Low water level protection prevents damage to heating elements. Heat-insulated, double-locking door safeguards against accidental burns. Dead bolt lock prevents door from being opened while chamber is pressurized. Electronically controlled models feature microprocessor control with digital display of operating parameters. Four fully adjustable, one-button programs provide easy, reproducible runs for wrapped and unwrapped items as well as liquids. User sets and stores operating parameters of temperature (105 to 137°C, 221 to 279°F), sterilization time (0 to 59 minutes), pressure (0 to 40psi), and drying time (0 to 99 minutes). User also sets and stores units of °C or °F and psi or bar. A sensor prevents operation until the door is securely closed. In-line filters protect all pressure valves. A low-water signal indicates the reservoir needs to be filled.